The Brush tool is one of the most versatile tools in SketchClub. It has toooonnnnnnssssss of settings so you can really have a lot of fun playing around to see what different effects you can get. There's also a pretty massive Community Brush Library where you can easily download brushes created by other SketchClub artists. The Brush settings panel has two pages: Select and Edit. 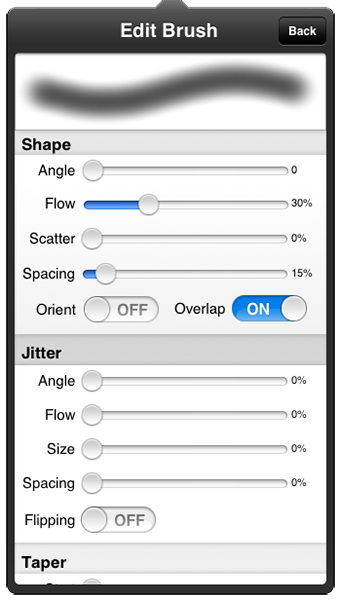 Tap the button in the upper right to switch from selecting between brushes to editing the selected brush and back. The first page let's you select between the different brushes you have created or downloaded. You just scroll through to admire your collection or tap to change between brushes. At the top is an option that lets you sort your brushes by Date or Slot. Choose Date to sort your most recently used brushes to the top. 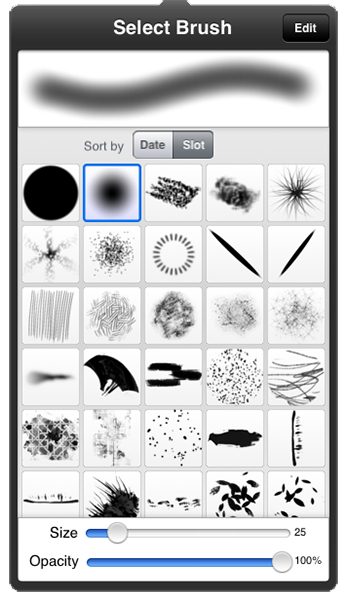 Choose Slot to display brushes in the order you created or downloaded them. Tap and hold on a brush for additional options like Reset or Delete and Share. The second page is where you edit the brush by changing its many parameters. As you change the settings you can see in the preview at top the effect it has in realtime. This lets you play with the parameters and quickly get a sense for what each does. Check out this great tutorial and video by Unihorse on how to create your own brushes in SketchClub. Scroll to the bottom of your brushes on the Select Brush page to find the Add button. Tap that to get to the community brush library. You'll see many different categories of brushes and can explore to find what might be useful to you or what may spark some fun ideas for you. Be sure to check out the categories for Recently added and Most downloaded!